Indeed, why not? 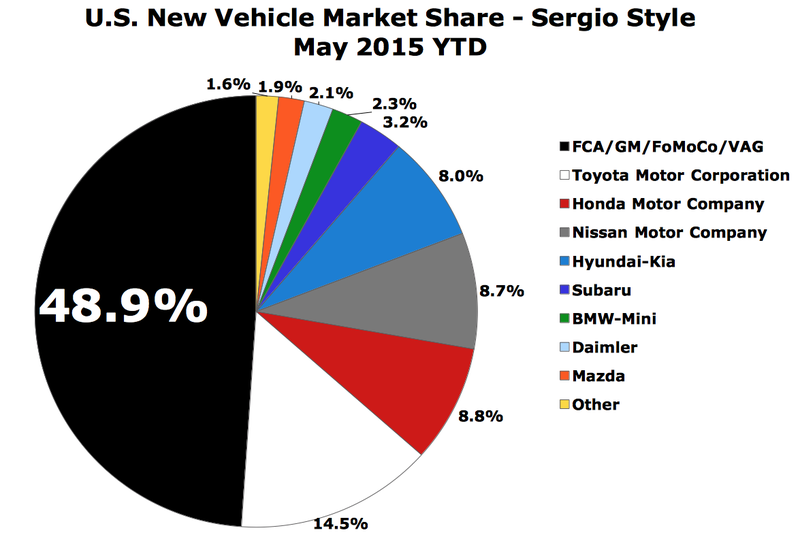 This market share chart looks at the U.S. auto industry’s first five months to see what Sergio sees in his dreams. For the real thing, including a complete sortable list of every brand’s May, year-to-date, year-over-year change, and market share results, visit GCBC. But for the fake thing, imagine an all-wheel-drive Fusion with the Challenger SRT Hellcat’s 707-horsepower engine, a Fiat 500X with the Volkswagen Golf R’s 292-horsepower turbo 2.0L, a Jeep Wrangler sharing a platform with the Buick Encore and Ford EcoSport, or a Ford F-150 with the Ram 1500’s EcoDiesel.